The Ian Dickie range of Mid-Block Jets are highly effective for clearing pipes from 75mm - 400 mm with a choice of electric start, diesel or petrol engines. The Mega Jet is able to clear lines from 75mm – 300mm and is supplied with 100m of hose as standard, while the larger capacity Giga Jet effectively clean lines from 75mm - 400m and comes with 120m of hose. These units are mounted on high speed trailers and are supplied with a 500 Lt supply tank and hydraulic hose reel. 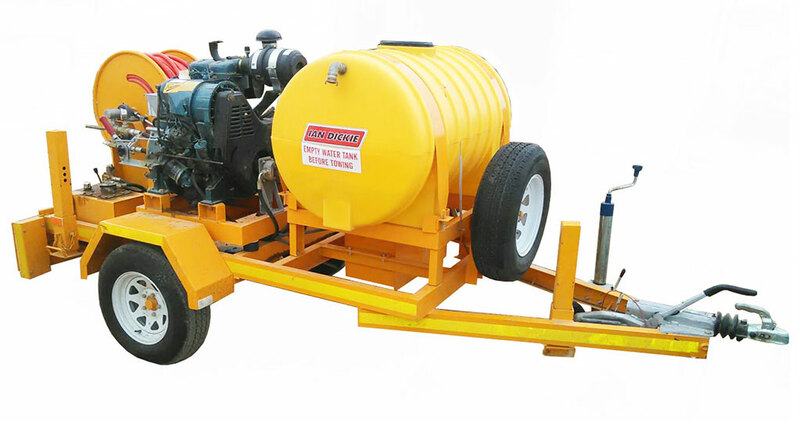 Used in combination with our range of rotating nozzles, these machines are used to great effect to clear drains and pipes of grease, oils, fat, sand and roots in sewers, factories, harbours, abattoirs, farms etc.